Especially for new players it’s good to have an idea over which cards in Clash Royale are considered the best, so that you can know which cards to request from your clan. 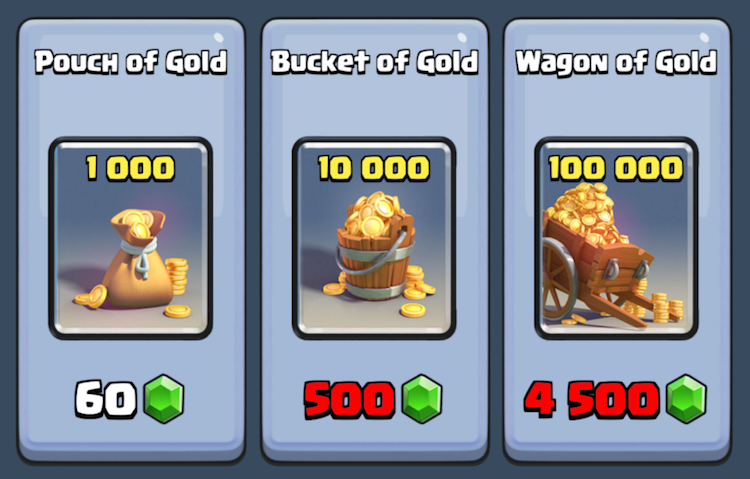 Also, you will often have several cards ready to be upgraded, but not enough gold to upgrade all of them. Then it’s nice to know which cards you should focus on. I base this ranking on which cards I believe you will have the most use for as you move up through the Clash Royale arenas. I don’t have the legendary cards yet, so they are not included in the list. I will start the with the honourable mentions and go up the list. UPDATE: I now have an updated to 20 list of the best Clash Royale cards. This list is based on which cards are most popular among top 150 players. These cards are good and quite popular in the game, but did not make the top 10 list. Please suggest other cards you like that I should add here, or if you believe any of them deserve to be in the top 10. The honourable mentions are in random order. This is a new card from the March 2016 update of Clash Royale. He is similar to the Prince in the way he is charging to do extra damage. However, the Prince weakness in dealing with swarms of small troops is where the Dark Prince is strong. That’s why Prince and Dark Prince is a popular combination now. 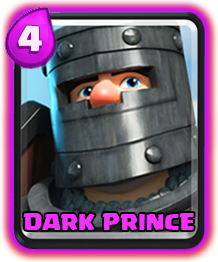 Alone on the tower the Dark Prince is not even close to as strong as the regular Prince, that’s why he is all the way down at 10th place. Read more about the dark prince here. The Golem is in my opinion the best high HP troop in the game. What pushes it down all the way to 9th place, is the high elixir cost, and also the fact that it can be easily countered by lots of different troops if you don’t back it up. 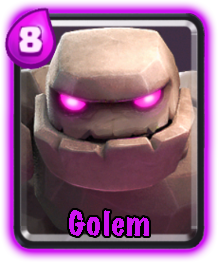 If you do support the Golem with other troops however, it is really really strong. Supporting it with weak range troops behind it like Musketeer, Bomber, Archers, Spear Goblins, Wizard and Witch works really well. Then your opponent basically have to kill the supporting troops that are hiding behind the Golem first, and that can be very tricky. The only hard counter to a Golem is the Inferno Tower. 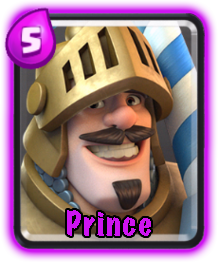 Prince is one of the best card in this game and is able to take out an enemy tower all on his own. That means you really force your opponent to react when you send a Prince at him. There are many ways to counter the Prince and end up with an elixir advantage, but good players use the Prince when they know their opponent is low on elixir and then get a ton of value out of him. The Prince can also be used in defence against high HP troops. You can learn more about the prince here. This card is used on Barbarians, Minion Horde, Goblin Barrel, Witch, Bomber, Wizard and lots of other cards. Lets say your opponent drops a Giant, he will often follow up with a Witch, Bomber and Archers. 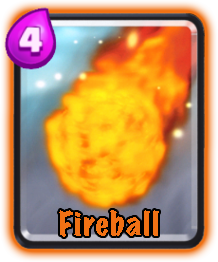 Your fireball will take out all the troops behind the Giant and they are the ones that cause the most damage. Fireball is similar to Arrows, the difference being a smaller target area, higher cost and higher damage. In some decks Fireball is best, in some decks Arrows is the way to go. Arrows have a huge radius and gives you so many opportunities to deal with swarms of troops approaching your towers. 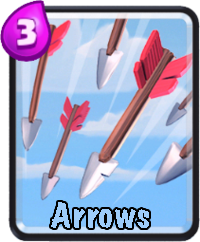 Arrows also gives you so many way to gain an elixir advantage in the game. Say you take out Goblin Barrel with Arrows, you will gain a 1 elixir advantage. If you take our Minion Horde with Arrows you will gain an instant 2 elixir advantage which is huge. Arrows is in my opinion the best spell in Clash Royale, with Fireball at a close 2nd place. The Hog Rider is my favourite tower killing card in Clash Royale. There are just so many advantages to using the Hog Rider instead of the other tower killing troops like the Prince, Balloon, etc. The Hog Rider cheap at only 4 elixir, while it still has a lot of HP and does a ton of damage. Another great thing with the Hog Rider is that it goes straight for your opponents towers or defensive building, and it can even jump over the river and small troops. It won’t be distracted by enemy troops but will go straight to the buildings with his huge hammer to cause damage. All of this makes the Hog Rider the best offensive card in the game. 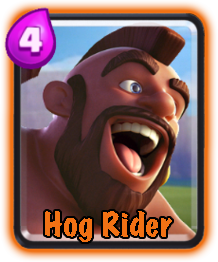 You can see a great hog rider deck here. 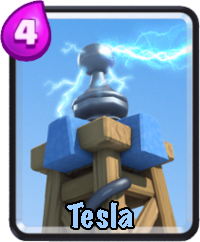 With the changes made to the Tesla a couple of weeks back, it is now one of the most powerful cards in the game. For the amount of HP you get, and the fact that it can hide under ground to avoid spell damage, 4 elixir is a really low cost for it. Tesla is not a card that will fit into deck, like my top 3 cards do, but most of my best decks have Tesla in them. Placing the Tesla in the middle of the area in front of your towers enables it to shoot at and distract troops coming from both lanes. Spear Goblins fit well in most decks and will give you great value. Since they only cost 2 elixir, there is no way to kill them with spells and an elixir advantage. When you place the Spear Goblins well they are worth way more than their elixir cost, being able to deal with both air and ground troops. 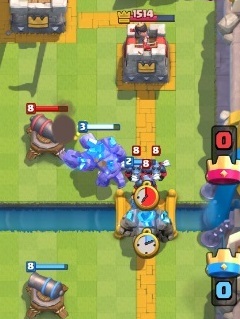 Since there are actually 3 of them, they can be used to distract a Prince or Mini Pekka while your towers deals with it. In offence this card work great as well, solo the 3 spear goblins will do a few hundred damage to their tower, but it’s when placed behind a tank like a Giant or Baby Dragon that they really shine. 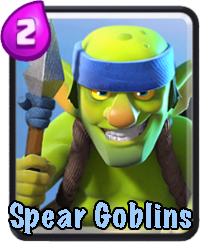 Spear Goblins is also a great card to open with, due to the low elixir cost and decent damage they do to towers without backup. 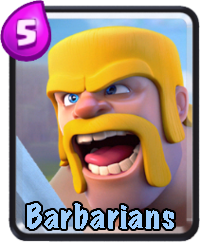 Barbarians are great value and the card is used in almost every Clash Royale deck. This card is just a ton of value, for only 5 elixir you get 4 strong barbarians with 500+ HP and 80+ DPS each from level 7 and up. They just deal so well with a large number of the most dangerous troops your opponent can send at you, like the Giant Skeleton, Pekka, Golem, Prince, Hog Rider, etc. Even when there are air troops approaching your tower, you can use the barbarians to soak up damage while your tower takes them out. Now we talked about defence, but Barbarians work well on offence as well. If you get 4 barbarians on a tower dealing 80DPS each, it will go down in a matter of seconds. They do walk a little slow, but putting a Prince or Hog Rider behind them work really well. Barbarians are in my opinion the best common card in the game and this lands them on a strong 2nd place. And the winner is…. the Baby Dragon! I have a Baby Dragon in almost all of my decks, and I’m so happy I finally got this card to level 3 just recently. 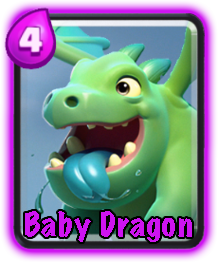 The Baby Dragon is hard to kill and there are no other cards that can counter it well, so it’s a safe card to open the game with. The Baby Dragon does decent damage 1 vs 1, and great damage as splash hitting both air and ground troops. It’s cheap to play at only 4 elixir, compared to the other cards that do splash damage to air like the Witch and Wizard at 5 elixir. If you leave it alone it will do a lot of damage to enemy towers as well. All of this makes the Baby Dragon the best card in the game. I’d love to hear what you guys think about my ranking of the top 10 cards in Clash Royale. Are there any cards I should add to the list, any I should remove? Check out my update list of top Clash Royale cards here. WHY NO ELITE BARBARIANS??? THEY ARE SO GOOD. I would get all the cards before I make this list, these cards are probably the best for noobs who have no idea how CR works. My favorite isn’t in most top 10’s. Mini pekka is fast, hits very hard and has a ton of hit points for 4 elixir. The balloon is good but is easily taken out by my Tesla, leaving the bomb useless. elite barbs, the fire spirits, then rage. Same here. I play with the same strategy. My lead attacker is the Elite Barbarian. I use arrows too. Because some opponents use the zap to destroy fire spirit. So arrows will work . You have to add the Elite Barbarians and Fire Spirit! Minion horde can wreck baby dragon. TRAAAASSSHHHH WHERE IS THE PRINCESS???? lawl why u on this article rocky. You should update your list. Fire Spirits, for their cost pack a real punch. They are fast,do heavy aoe, and significant crown tower dmg. You can use them to easily take out minion hordes and swarm units and they can reduce Barbs down to nothing. I use them as a direct counter to barbs, the crown tower finishes them off with a couple hits each and i gain a 3 elixer advantage. I also use it to bait arrows and zap so i can drop my minion horde after. But if I just play them on their own, most people just ignore them and let me take a 500 hp bite out of their tower. I would rank fire spirits in the top 5 of best cards in Clash Royale. Balloons? I agree overall with this. Dude spear goblins #3… what arena you are? One witch or musketeer (sry for mistakes), or valkyrie will take them down. Its like somebody says: “Tombstone is most OP”. I’m in arena 8, but this guide is old. Even so, spear goblins are decent, cheap anti-air units. Spear gobs have their uses…like taking down slow cards or valks. I’m in Arena 9 & I still use spear gobs ! They’re cheap AF & good in both offense & defense . Idk why you look so surprised ! The best cards vs the best deck. Use 8 of this best cards to battle the best deck. The best deck would win the battle. 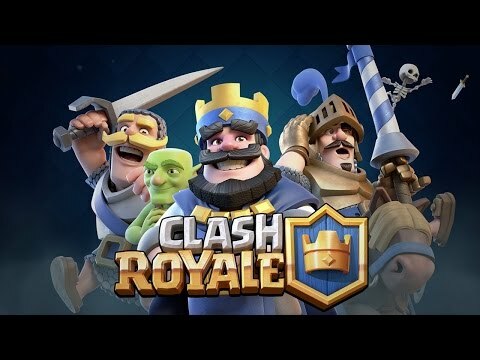 All of the cards/decks in Clash Royale has their own weakness, so actually there’s no any best cards or decks in Clash Royale. That is true, you can’t pick 8 cards from the top 10 cards and make a deck, the idea with this article is to give an idea to new players for which cards are most important to updates. That would be cards that fit in many decks. Golem is overpowered if combined with spear goblins and wizard. I often take half a tower’s health, if not the whole tower if I push with this early-mid game! Sure, Golem is really good, but it doesn’t fit in that many decks in my opinion. I will write a new version of this top 10 list soon. Lol baby dragon has no counter?? How abt musketeer and may be their trio and minion horde too can take them out or leave at the doors of death. What abt witch isn’t she worth the top ten?? I haven’t seen many good decks with the witch in it no. The dragon is not as good as I once though it was. I actually use the witch and she’s decent, but terribly low defence. You can place almost any ground troops between a witch and her skeletons and kill instantly :/ but its my only decent epic atm. I’m at 900 rank though. Also baby dragon is very very useful for opponets who use small troops, dealing splash damage. I use it for defence or to help push through small troops. I have never used the witch much, but also found her easy to deal with. I remember around 800-1200 she was very popular before though, guess that is the same still. The witch is not popular at all among top 200 players. my favorite is baby dragon and prince 😀 love them . i found a way to generate some free gems . look at my screen shoot . gonna buy some super magical chests this game is more funnier now . Haha..doubt it as 1st,, i avoid baby dragon since arrived at arena 5.. archer lvl 8 could kill it easily..
Yeah, I’ll make an update to this article soon. me too love the hog rider . im at arena 5 hope to go to 6 tonight . i used your suggested link and it worked pretty good for me .generated nearly 40000 gems . defenetly gonna use it again . My vote go for the 2 kind of goblins, arrows, venom, archers, esqueletonsx4, hog rider, minionsx3 …. This cards are the top for the tempo, that is one of the most important factor un this game. Minion Horde obliterates Baby Dragon with ease. If you don’t have the right cards in your hand to counter it yeah it’s strong. I don’t think Inferno Tower is that strong, it’s decent but not top 10 imo. Probably yeah, I’ll go over the list again soon. I think mini Pekka is better becuase it is cheaper and walk faster, but its health though. Baby Dragon is good. If you got the upgrades. He must be joking. I just completely ignored 2 baby dragons, they did about 300 tower damage each… While I saved up and wiped out the other guys main tower. I used to use baby dragon a lot and it was working great, that was in the 1200-2000 range. Now I don’t use it much anymore, I think I’ll make some changes to this top 10 list soon. I don’t think Balloon is strong enough for top 10, but it’s close. I love those skeletons! Great to add DPS to an attack, or slow down an army at your own tower. Yeah I also use them now. I went a long way with the huts up until level 7. Now, it isn’t working so well…. Solid list, I especially like the top 6 while not being able to vouch for the epics at the back of the list. My only quibble is Minion Horde getting the honorable mention over Minions. Maybe it is because I run Arrows in most of my decks, but I am very rarely ever hurt by Hordes, though when I don’t have Arrows they can sometimes take out my Tesla. Minions on the other hand still have the same efficient stats as the Horde does (minus the 1 free minion), and their reasonable cost allows them to be way more versatile in comparison. I almost always use them on defense, where they can eat throw just about any ground-pounder in the game, however they can also back up a Baby Dragon quite well for a makeshift offensive strike, or attack Bomb Towers and the like. Arrows in Minion Hordes biggest weakness for sure. I don’t face Arrows that often though, and often the Minion Horde is able to deal a lot of damage before the Arrows or Fireball land, which is really important in defence situations. Minions probably deserve a honorable mention as well though. Well…giant skeleton is an awesome card and should be on this list. And wizzard should be in the honorable mentions. Also goblin barrel should be either in the top 10 or honorable mentions as well. Not to mention bomb tower with it’s superb hp should be where tesla is. I agree with the Giant Skeleton, I’ll see where I can place it, it is a pretty good card. The others are ok, not more than a honourable mention I’d say though. Yes, the giant skeleton is very good fro distracting and taking out large groups of troops. AND if it makes it to an opponents crown tower, it will take major damage when it dies.